Installing carpet is an important and costly decision for any home owner to make. We at Flooring, Kitchen & Bath Design want to make sure you understand some of the important benefits of installing carpet, so below are what we believe to be some of the best reasons to install carpet flooring. 1. Warmth and Comfort – Carpet actually provides thermal resistance (R-Value). On colder days, carpet retains the warm air adding to the conservation of energy and the comfort of your home. On warmer days, carpet actually resists the change of temperature and contributes to the insulation of your home. Besides providing comfort through the regulation of temperature in your home, it also provides a very comfortable place to play, work, sit, relax, and anything else you can imagine. 2. Style and Beauty – There are thousands of carpet styles and colors to choose from giving you the ability to really personalize your home. Carpet can serve as either a neutral foundation or it can serve as the focal point of any room utilizing vibrant colors and strong bold textures and patterns. 3. Indoor Air Quality – Contrary to common belief, new carpet is the lowest VOC-emitting flooring choice available. Properly installed carpet and padding act as a passive air filter effectively traps particles, dust, and pollen. Trapping these particles allows them to be removed them from the breathing zone and conveniently vacuumed up. 4. Cushioning of Slips and Falls – Carpet cushions our footsteps, reduces slips and falls, and minimizes injuries when falls do happen. It essentially provides safety protection for the whole family, but especially for toddlers and older individuals. This is the main reason that many homeowners opt to install carpet on their staircases. 5. Noise Reduction – Carpet works as a noise reducer in the home and an effective sound barrier between floors by reducing the level of sound transmission to rooms below. 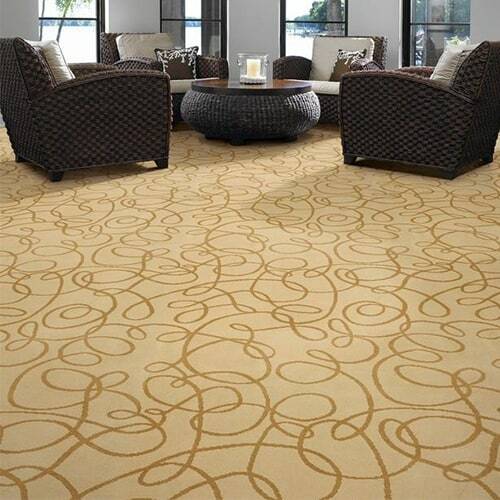 We carry all of the latest quality and in fashion carpet products on the market. Whether its the look, color, pattern, style, or resistance to pet accidents that you are looking for, look no further, we have it!